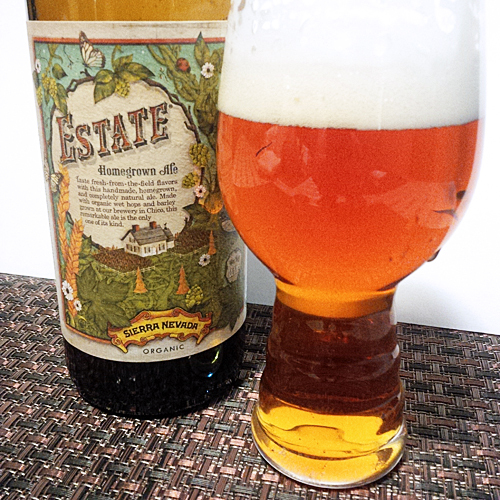 Sierra Nevada Estate Homegrown Wet Hop Ale: Brewed in Chico, CA at a strength of 6.7% abv with 67 IBUs this wet hopped ale is made completely from organically grown hops featuring Chinook, Cascade and Citra hops and malts at the brewery farm which is pretty impressive. I managed to snap this up during a recent visit to Haggen in Bellingham, WA on a final search for USA wet hopped beers that proved fruitful. This was bottled Oct 10, so it was about a month old when I drank it when it was just nearing the end of its best drinking window. Aroma and Appearance: It pours a clear copper colour with 3 fingers of white foam and a middle of the row carbonation level. The aroma is fresh cut grass, lemon citrus, tangerine, tropical mango and sweet caramel. Flavour: There is some caramel and toasted bread up front with lots of earthy, woodsy and floral notes in the middle of the sticky toffee malt and finally it finishes with a grapefruit pine resin bitterness that is salivating and quite nice. Overall Impression: Glad I picked this up, a little different than the other fresh hop beers I have had this year. Rating: I give it an excellent rating of 8/10, very nice annual pick up for me from now on. Food Pairing: Keep it clean and enjoy the fresh hops, no food pairing suggested here. It’s easy to forget some of the pioneers in Craft Beer like Sierra Nevada who are quite large and are considered by some to be a commercial brewer, they still make great beer and have evolved themselves over the past 30 years to stay interesting and relevant. Here’s a good video worth watching that features their brewery and some interviews with their founder.